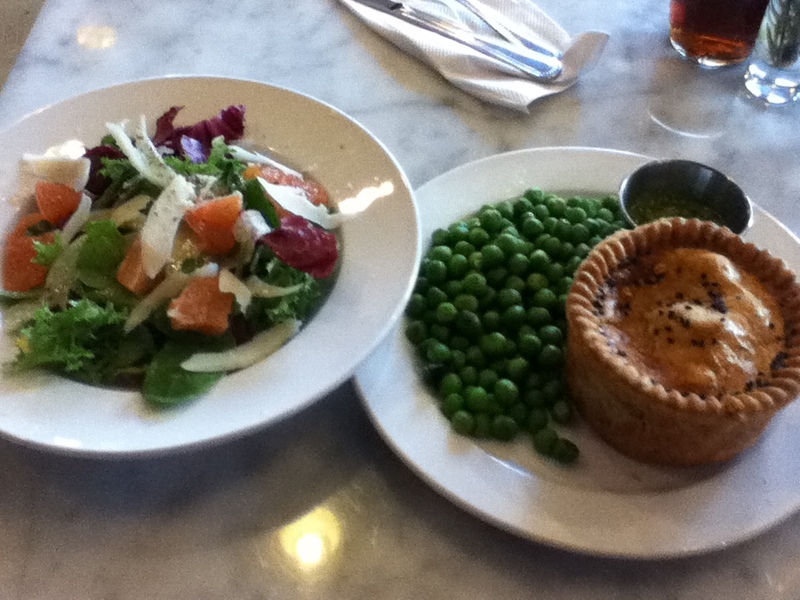 Chicken Balti Pot-less Pie, Minted Peas and Pleasant Farms-grown winter greens salad with shaved fennel and grapefruit (thanks Kevin Pang!). I knew nothing about Chicago’s food scene. I’d only spent one night here before, on our summer 2008 cross-country drive en route to Oregon. And after traveling with six-month-old and teething Theo for the past three weeks, needless to say, I didn’t have time or energy to research our food options in advance of our 48-hour layover here. Of course, I knew Grant Achatz’s Alinea, but they’re booked up through October. I did manage to get a call for a spot off the wait-list, but the 3-star Michelin molecular gastronomy temple doesn’t permit children under age 14. So I turned to Twitter. I desperately directed-messaged Chicago Tribune “Cheap Eater” Kevin Pang for a baby-friendly, non-touristy, affordable spot, accessible from downtown. Within minutes, he directs me to Bar Toma, the new wood-fired, locavore pizza/gelato/pastry/espresso joint from Tony Mantuano, of Spiaggia restaurant and Top Chef fame. Pang won my trust. I devoured my La Quercia proscuitto with arugula and mozzarella pizza, chasing it with a Manhattan-like cocktail and then a local Heiffeweizen, an over-tired Theo finally asleep on my chest in the Ergo. 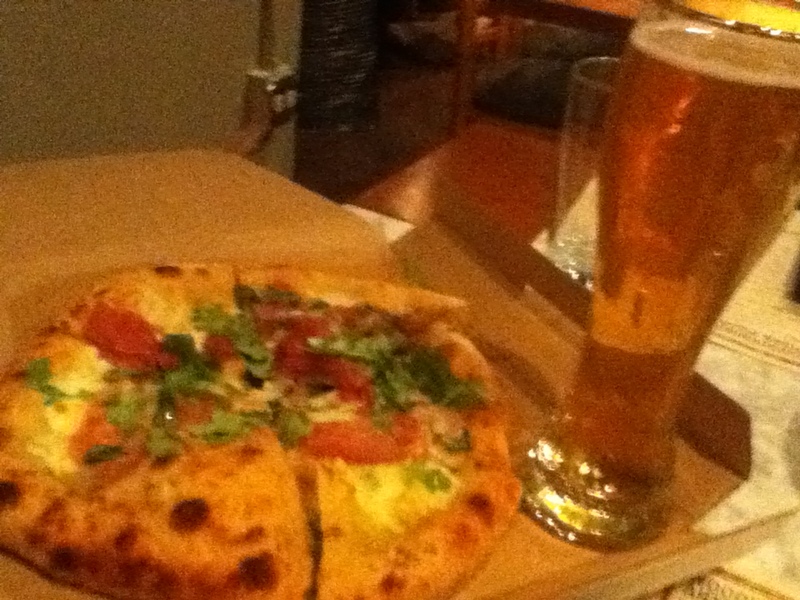 Bar Toma pizza and local weisse beer. So I took Pang’s recommendation for the best new restaurant of 2011 to heart. The erstwhile Baltimore dwelling, former Bronx teacher, gritty journalist in me is drawn to revitalizing neighborhoods like Bridgeport (an immigrant enclave once known as “Hardscrabble”), a semi-vacant former stockyard zone on Chicago’s South Side. Plus, I was headed to Bridgeport anyway, to scope out the new Chicago headquarters and large Iron Street Farm of Will Allen’s Growing Power (more on that industrial oasis, with its vermiculture, tilapia tanks whose waste nourishes hydroponic kale plants and oyster-mushroom growing bales later). All I can say is, everyone on the #9 bus acted like I was crazy when I asked how to get to the farm on Iron Street. As Theo and I strolled past a Pepsi bottling plant, a man I asked for directions asked if our car had been impounded. We were more confident, with a determined hunger, on our subsequent walk to Pleasant House Bakery. I wasn’t away of the humble restaurant’s gardens I must have passed, where they source much of their kale for delectable creamed-spinach-like and mushroom pies. I’m running out of steam here, but the tomato curried Chicken Balti pie, with a side of sweet minted peas, was divine. If only I’d had room for the sausage-encased, battered Scotch egg, a British delicacy I’ve never tried, which I also regret passing up at Ping’s Cafe in Vancouver. Chefs and co-owners Art and Chelsea Kalberloh Jackson couldn’t have been more hospitable when our car-seat and stroller barged into their cozy space. It turns out 3 pm on a Saturday, between the lunch and dinner rush, is the ideal time to dine there with a baby. If I was childless, I’d have had my food delivered I to Maria’s Packaged Goods and Community Bar. Instead, I washed it all down with a homemade spicy ginger ale and then a coffee and brown-bagged a Two Brothers barley wine from Maria’s to take back to the hotel. And fortunately Theo once again fell asleep on my Ergo-ed on our long walk down Halstead back to the Orange line. Sounds like you had a great time in Chicago! Glad that Theo doesn’t slow you down; maybe he will become the youngest gourmet ever! The food scene was really inspiring. It was just such a tease to only be there for 48 hours. We also loved your recommendation of Jasper White’s Summer Shack in Dedham. Had delicious whole belly fried clams and luscious Cotuit oysters on the half shell there. Summer Shack is a really good place for seafood, even in the dead of winter!